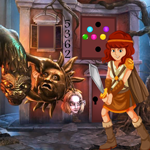 Games4King - G4K Viking Woman Rescue Escape is another point and click escape game developed by Games 4 King. There are many miracles and strange parts in a beautiful city. All rooms in the room were created in a strange and chaotic manner. In that strange mansion, a beautiful viking woman has been locked up. It is your duty to save the girl, who is locked up. Find the hidden clues and help save the viking woman. Good luck and have fun! where do I use the screwdriver? Beth in room were green heads go.